Alfred Noyes (born in Wolverhampton, England) was a famous Poet from England, who lived between September 16, 1880 and June 28, 1958. He became 77 years old. Alfred Noyes was an English poet, best known for the balad The Highwayman (1906) and The Barrel Organ. Noyes was born in Wolverhampton as the son of Alfred and Amelia Adams Noyes. Noyes went to Exeter College, but quit before he finished his studies. 21 years old he published his first collection of poems, The Loom years. In 1907 he married Garnett Daniels. 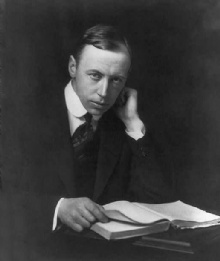 He eventually got the opportunity to teach English literature at Princeton University, which he did from 1914 to 1923. Noyes say wife died in 1926, which meant that he converted to Catholicism. He wrote about described in detail in The Unknown God who became publisher in 1934. Noyes later married Mary Angela Mayne Weld-nap, from one recusant Catholic family. They settled in Lisle Combe, near Ventnor on the Isle of Wight and had three children: Henry, Veronica and Margaret. Margaret married later with Michael Nolan (later Lord Nolan) in 1953. He later began to dictate their work because of rising hot blind. In 1953 his autobiography, Two Worlds for Memory out. He is born under the zodiac virgo, who is known for Analyzing, Practical, Reflective, Observation, Thoughtful. Our collection contains 4 quotes who is written / told by Alfred. "At a certain stage in his evolution, man himself had been able to lay hold upon a higher order of things, which raised him above the level of the beasts that perish, and enabled him to see, at least in the distance, the shining towers of the City of God"
"Of the sayings of Christ in the Synoptic Gospels that can be compared to those in the fourth Gospel, there are one or two which I venture to think can only have been recorded on the authority of St. John"
"St. Luke again associates St. John with St. Peter in the Acts of the Apostles, when, after the Resurrection, that strange boldness had come upon the disciples"